We often plan our lives a year in advance. Holidays coinciding with certain days of the week mean that we can have a longer or shorter amount of time off. It is through the calendar that we know whether or not we have a long enough stretch of time to make it to and from grandma’s house without tiring ourselves out from going on vacation. If you must plan your life based around a set schedule, then not having to tap through the entire calendar on your smartphone might be nice. 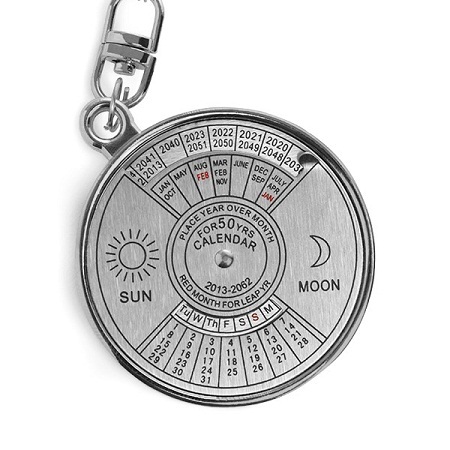 The 50 Year Calendar Keyring will help you to know exactly what days of the week will be falling on what date until 2062. As was stated, this is meant to be a keyring, so it’s very small. The biggest question begs whether or not it can stand 50 years of being banged and tossed around, as most of us don’t really think about being gentle with our keys. Regardless of whether or not it can stand the test of time, it would at least be helpful for the next five year span, as most of us don’t plan things much farther in advance than that. This will only cost you around $7, and could be a lovely gift for those who enjoy planning out their year a year beforehand. For those of you concerned, yes, this does adjust for leap years! The only saddening aspect is that 20 years from now will only seem like yesterday that you bought this.